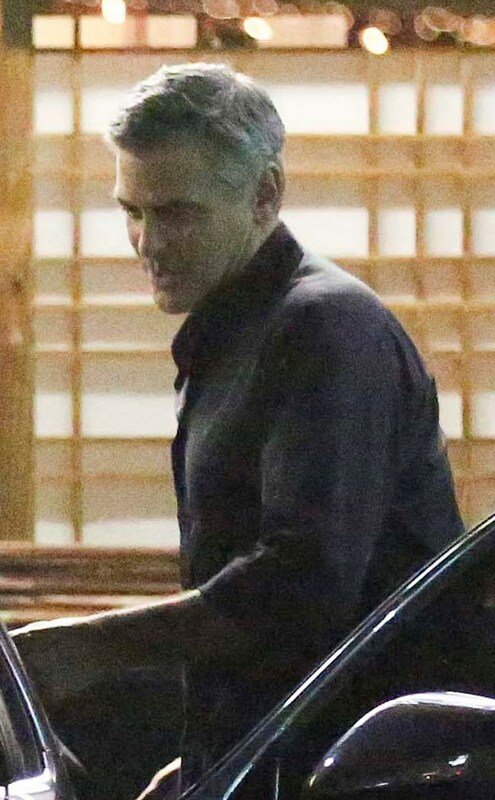 Amal and George Clooney have been spotted leaving Asanebo Sushi restaurant on Wednesday (December 10) in Studio City, Calif. 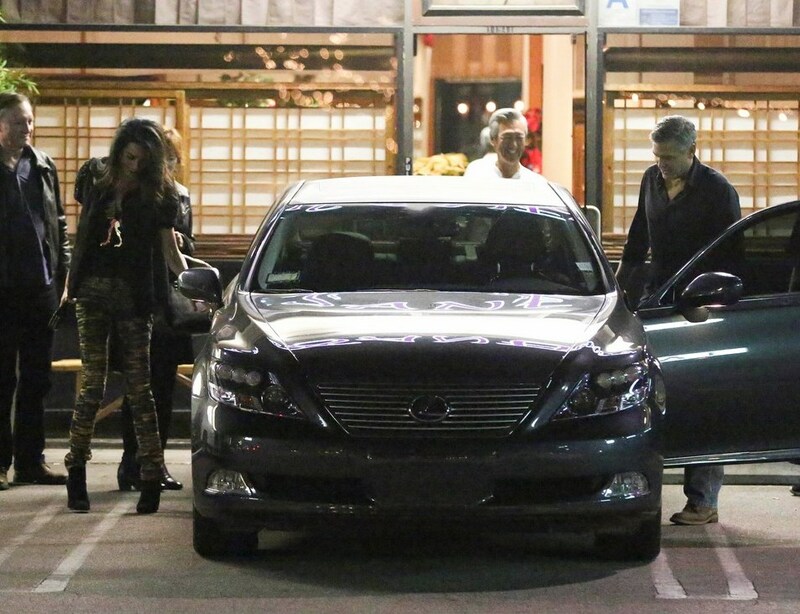 The couple was joined for the dinner by close friends, who sat in the backseat of their car. 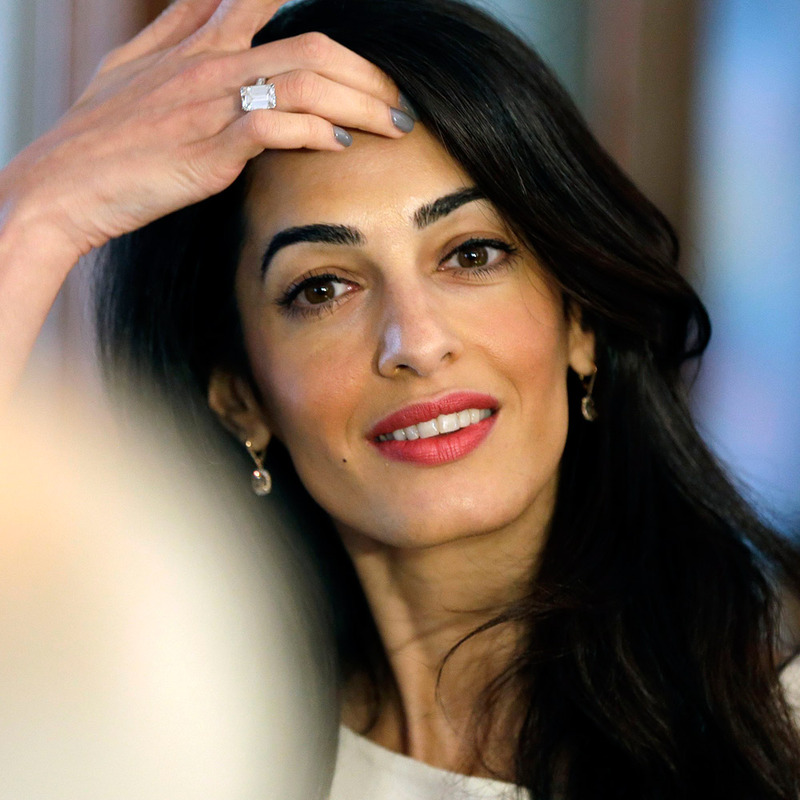 Amal Clooney wore a fur jacket with embellished short sleeves. 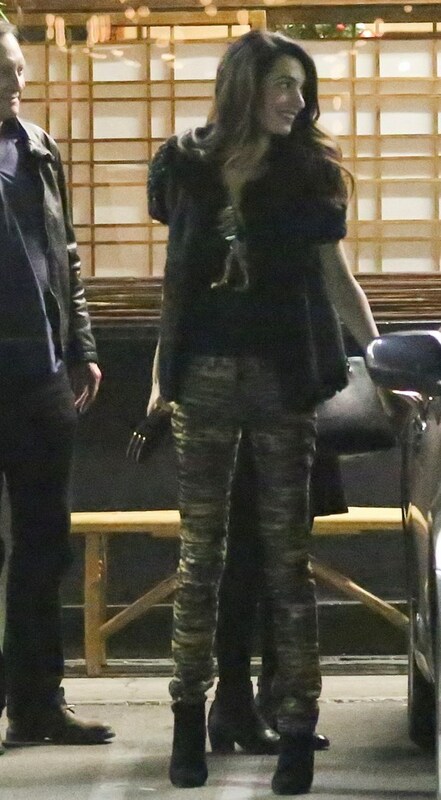 camo jeans, geometric clutch, suede boots (the Prada) and a dinausor statement necklace in gold. 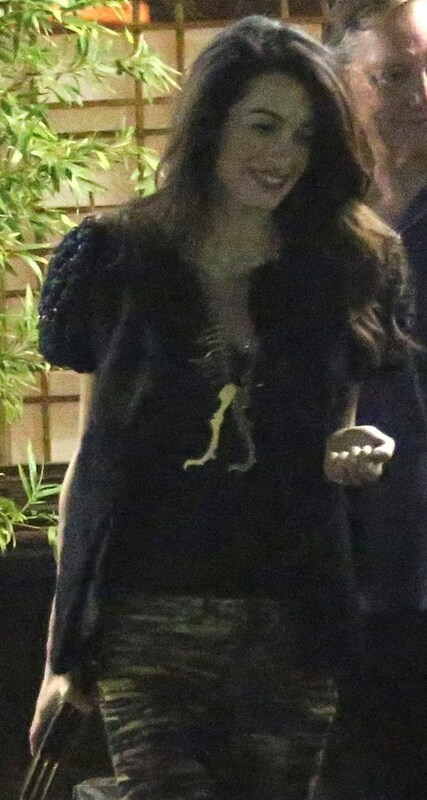 She looks so stylish and perfect for a dinner with friends. First question, the jacket/vest, is it real fur ? Karl Lagerfeld and Chanel have some fake luxury coats, but nothing similar. I found the style very similar to Fabio Gavazzi collection 2013/2014 and am asking them for a confimation. 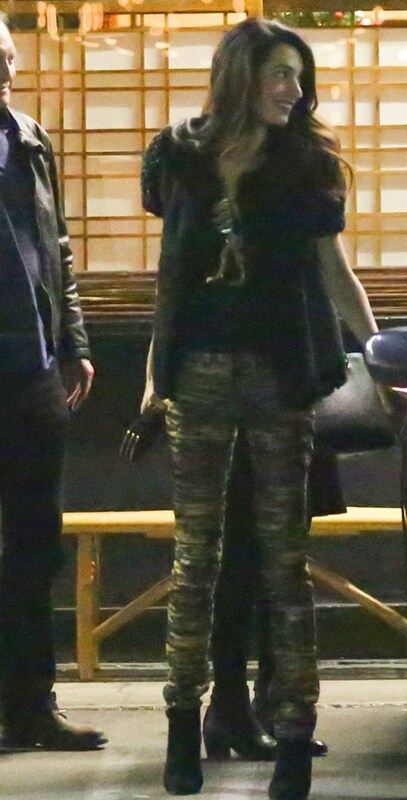 The camo jeans have been identified by the DailyMail as Current&Elliott, but the ID seems to be wrong. Not the same color and shape. She wouldn’t never wear gold accessoiries with gray camo jeans …. 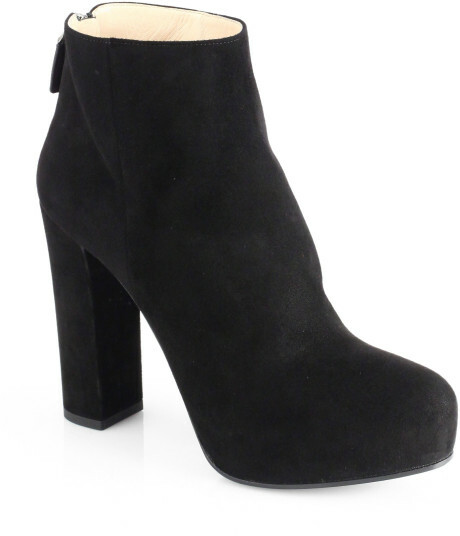 With big thanks to http://www.eclecticstyleblog.com/ we have an ID and I could find them on sale ! I hope not. The outfit looks good on her. I find it odd that he does not open the car door for her. My husband always does this without even thinking. That is what gentlemen do. Maybe George is no t so soave after all. Wonder if she works anymore? She takes a lot of time off for being a lawyer at a big law firm. I agree Donnie, how come he never opens the door for her..he is from a generation that automatically does this for their lady..what’s up with that? Hey, George, while we are at it, you should be carrying her shopping bags too, that is very much a Midwestern etiquette gesture if not American. And Amal, here is an advice, sweat the small stuff from now for better returns in the long run. If it is a Fabio Gavazzi jacket, it will be real fur. 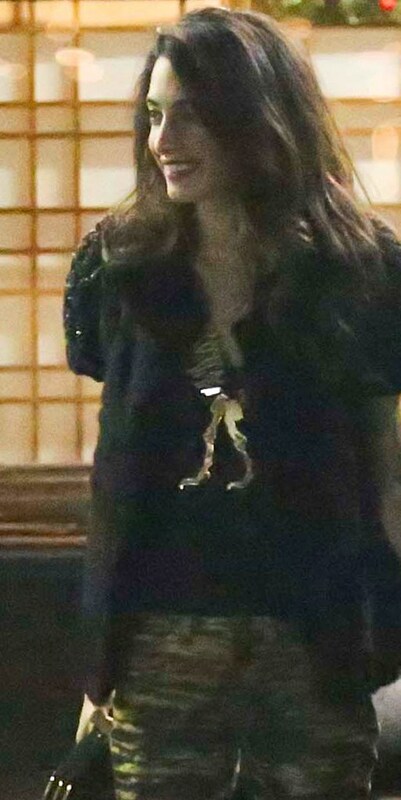 have you noticed that she is now wearing her engagement ring back on her left hand and her wedding ring on the right? not that it matters, but i thought that interesting. thanks for your blog, i check it everyday!! Great outfit! And isn’t her hair gorgeous! Love the boots. I also wish it was warm enough where I live so I could go outside in short sleeves! 🙂 Love your blog! Happy Sunday to you! 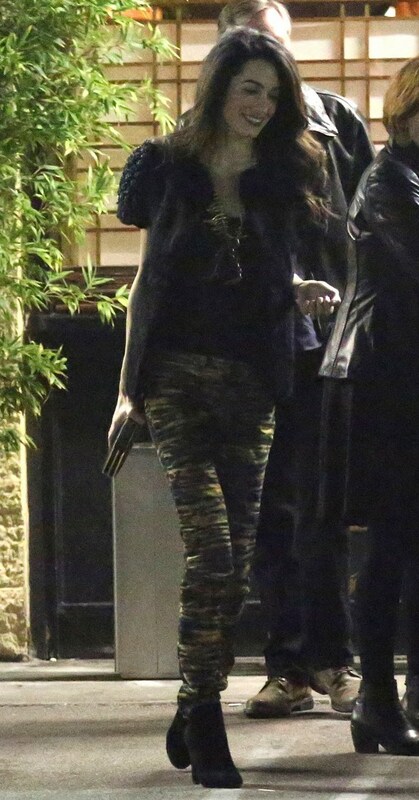 The pants of Amal are very beautiful , but she and’ too thin !!! I hope that the fur is fake !!! I think wear a real fur in 2014 is terrible !!! 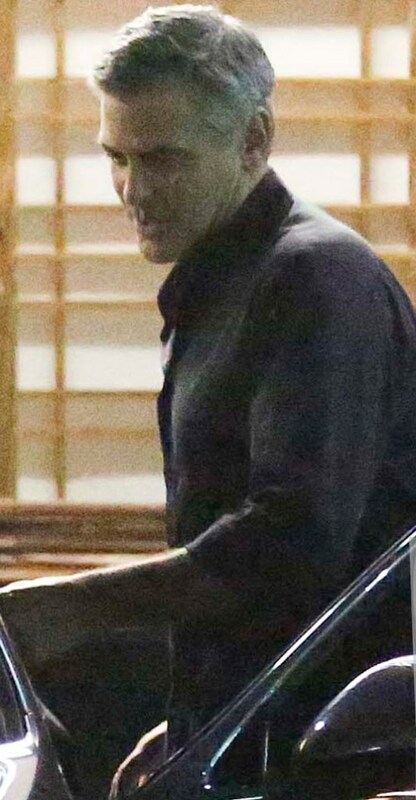 Who knows’ why ‘ in almost all pictures Amal always smiles …….George instead’ serious and sullen !!!! Ich bin geschockt. Gentlemanlike ist das nicht!!!!!!!!!! Ein Gentleman hilft seine Frau ins Auto und setzt sich erst dann ans Steuer. I like everything but the fur vest and the camo jeggings. 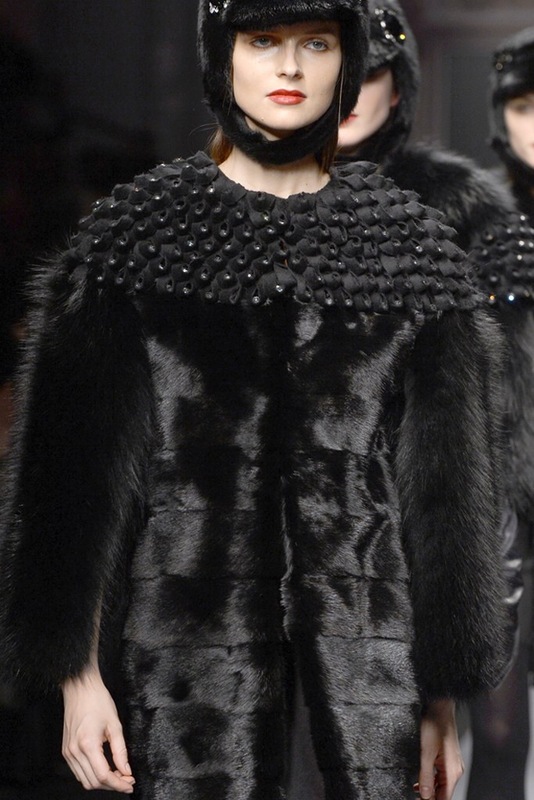 The fur vest looks like the crazy love child of the vest Barney Flintstone wears and a black flokati rug. As for *anything* camo – she’d fit right in shopping at the Wal-Mart located an hour out of any major city in America, where all the men walk around in camo and spit chew. 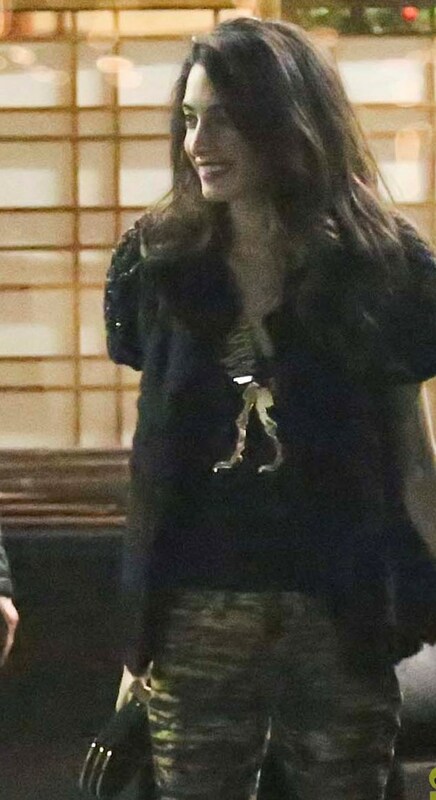 Other than that: nice dinosaur necklace and booties! And, nice clutch – forgot to add that. Ummm, I don’t think this is a flattering look. It would work on a 16 year-old girl who is deliberately looking trashy for fun and attention, but it doesn’t work on a soon-to-be 37-year-old attorney of her professional stature. There’s something wrong with her style sense when she’s not dressed for work. It seems to be all about getting attention, and is the opposite of classy or tasteful. This is a particularly heinous ensemble. A puffer vest would have looked more modern and sleek and is utilitarian. As it is, it looks like a buffalo hide has attacked poor Amal, and George is doing absolutely nothing about it. Yep. Really, really tacky look. Rich tacky. 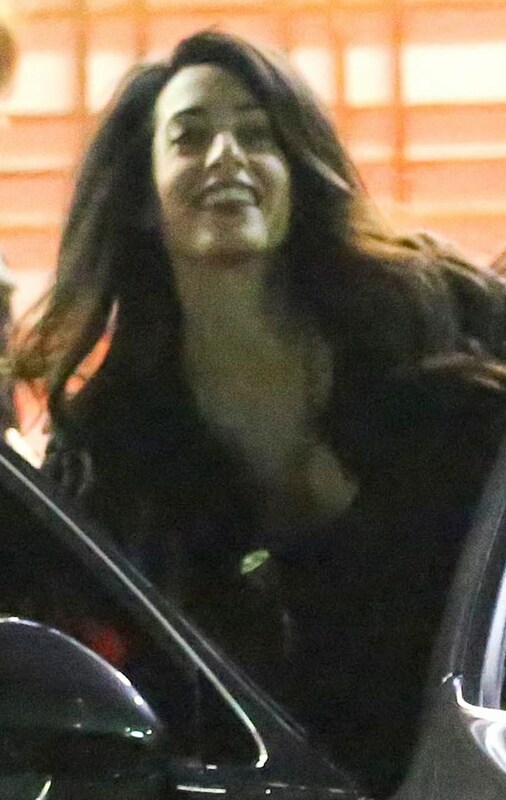 I think George didn’t open the car door because the attendant had opened his door so he got in the car first and Amal and the other couple followed. Take it back. He does open the door for her. My faith has been renewed. :) The fact that she continues to wear fur makes me furious. 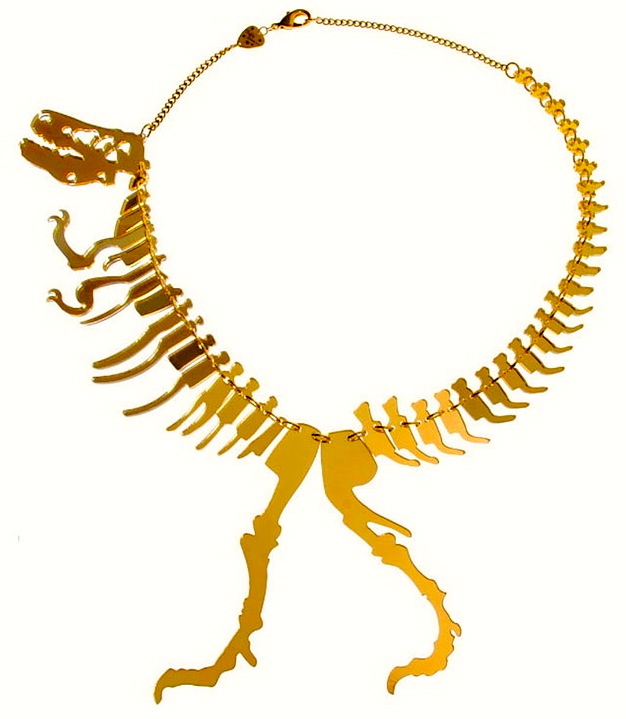 Great necklace. Boots ok. Clutch – too much for this outfit. 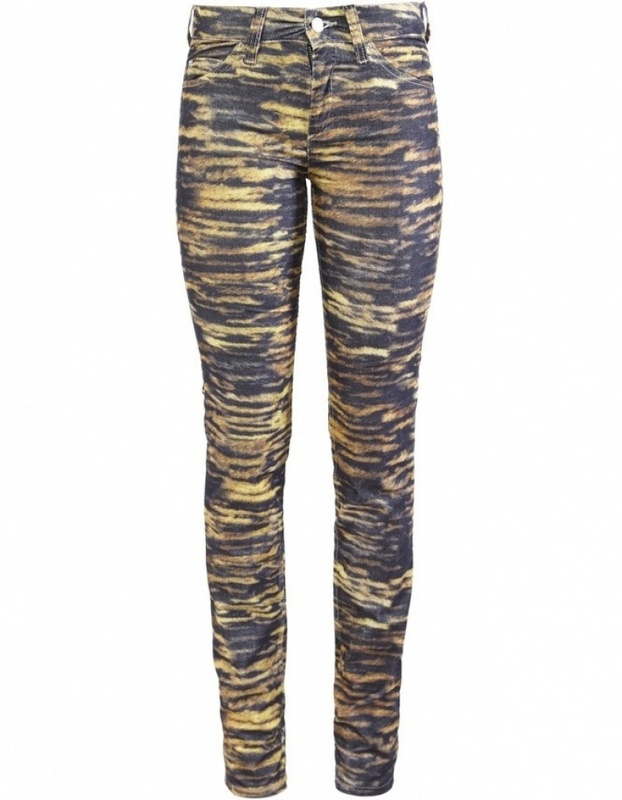 Pants – if she wore it with a white shirt and a great pelt and a fitted jacket it would of worked. There is something fascinating about Amal and George together, I can’t get enough! I even spent 3 days camped out on the grand canal with my camera to spot them when they got married and was rewarded with some great shots! And although I could never carry off most of what Amal wears I do like her style and the way she puts outfits together most of the time, except for the fur! Keep the posts coming! If the fur is real, I would be terribly disappointed in her choice. 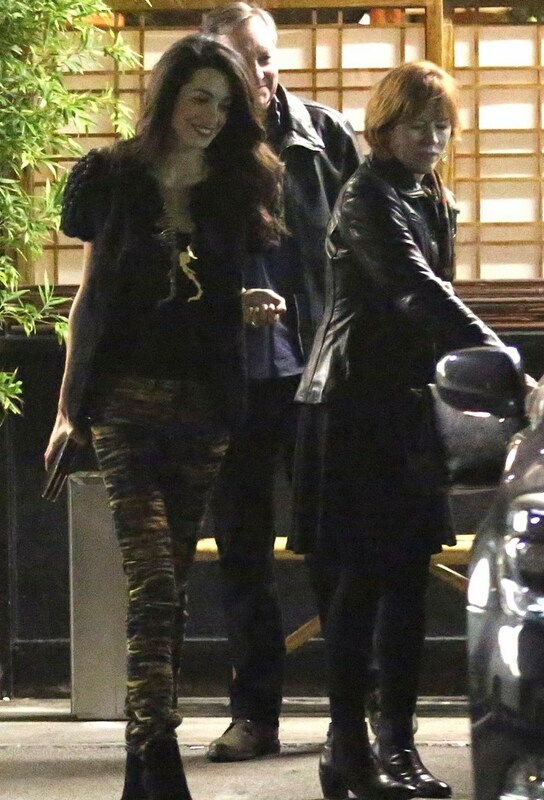 It was bad enough she wore a python jacket recently (which was my first clue that she is superficial.) She is coming across as a bit of a flake, rather than someone who is considered intelligent, sophisticated and worldly. Maybe we have been mislead and she is indeed lacking substance. Hope she gives this some serious thought in her future wardrobe selections. Fur vest? Python skin jacket? 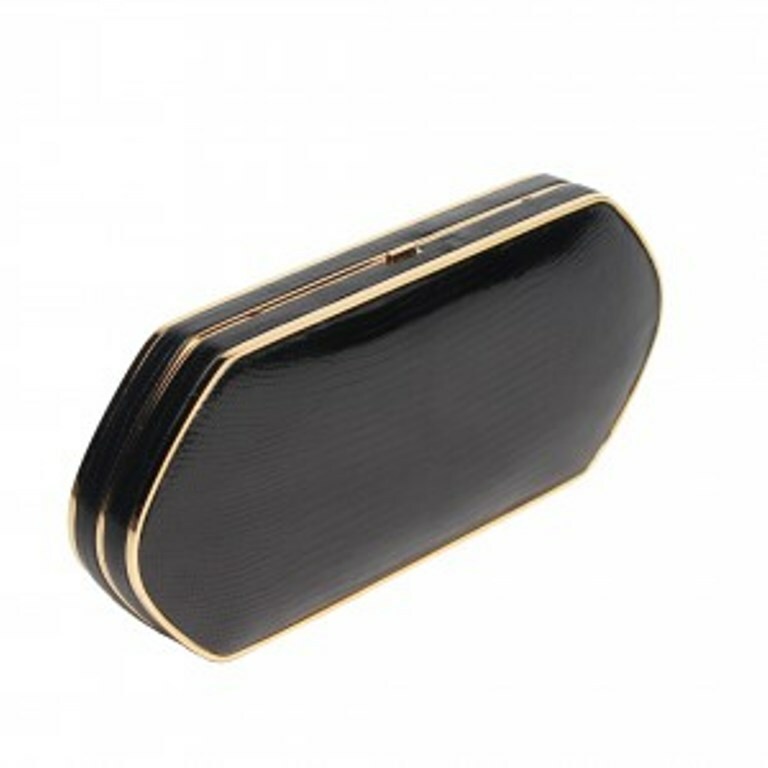 A new clutch or bag almost every time? Is that really a style icon? LOL! Wait until Golden Globes for more of those.Obviously she isn’t going back to work until then it seems.